COMMENTARY: How Lowebow Can You Go? Lowe with some of his bows. This unique endeavor began in 1998 with a stray comment from one of Lowes customers at his guitar store , Xanadu Music & Books. The customer, Jay Kirgis, an art student whose specialty was making cigar-box guitars as art pieces, happened to remark that no one seemed to be interested in outfitting cigar boxes with a one-string pick-up. Lowe started making these creations in earnest, and they quickly caught on with the more venturesome species of musicians. Lowe lists some of the players who currently own or play the Lowebow: Jim Dickinson was one of my first customers. He bought one for [son] Luther. Other takers: Harry Manx (blues/Indian fusionist); Microwave Dave (blues cat and DJ); Bo Ramsey (Lucinda Williams band); Greg Brown (folksinger). Someone gave one to Lyle Lovett. Richard Johnston encouraged me to design a three-string, and he won the Handy International Blues Challenge in 2001 with it. Johnston now plays the Lowebow (as he proudly dubbed it) at festivals all over the world, further increasing sales of his instrument. (Lowebows are featured in the documentary about frequent Memphis performer Johnston called Hill Country Troubadour; this can be sampled at www.maxshores.com/johnston/trailer ). As in any other cult or subgenre, there is a fanatical following for lovers of cigar-box guitars on the internet, based at www.cigarboxguitars.com, which began in Huntsville, Alabama. Lowe was understandably upset when he found out that others were using his ideas to create their own cigar-box guitars. I used to get mad and cuss em out, but now they hire me for their festivals and tell everyone about me! Lowe refers to the movement as a blog culture center, one that he says has more than a thousand members. 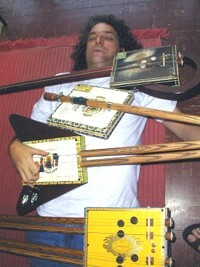 Matt Crunk even started a cigar-box guitar festival in Huntsville, Alabama, where Lowe has played and sold his inventions. While Lowe has several Lowebows on display at his shop, most of the ones he builds now are custom instruments built to spec and sold over the internet. More than 50 percent of his business is online, but Lowe, ever the iconoclast, says he is too lazy to build his own website. When asked why, he replies, People make em for me! Indeed, there are at least two websites not affiliated with Lowe that promote Lowebows. Lowe does make a small concession to commercialism by having a toll-free phone number (888- 838-9885). Gibson Guitars offered Lowe a job in Nashville, but he turned them down. Peavey Guitars had a conference with Lowe and Johnston, but they quickly realized they could not mass-produce the Lowebows. Recently, Lowe has spent time making the Lowebows, playing in festivals where he sells the Lowebows and promotes the instruments, and coming up with new music items. Its the cornerstone of my business now. It did kind of save my business. Among his regular festival venues: the Shell, the Clarksdale-at-Cathead Folk Art, the Helena Blues Festival, Othar Turners picnic, and Huntsville, Alabama. His newest invention is the tambourine-like Shake, Shake, Shakers (named after the Jessie Mae Hemphill line) which he makes with leftover cigar-box parts. As for the original Lowebow cigar-box guitar, surely now it is a priceless rarity? I sat on it on my couch and broke it, he says ruefully. Oh, well. There are plenty more original custom Lowebows from where that one came. Sam Phillips would be proud. Want to respond? Send us an email here. This Sunday, the Memphis Grizzlies will don throw-back Memphis Tams uniforms for a home game against the Utah Jazz. Memphis writer Sherman Willmott sent us this story about Memphis' ABA franchise and we thought we'd share it with Flyer readers. Ripping off a sister city doesn't make for beautiful music. Guralnick, Soul Machine score a triumph at the Rock 'n Roll Hall of Fame.